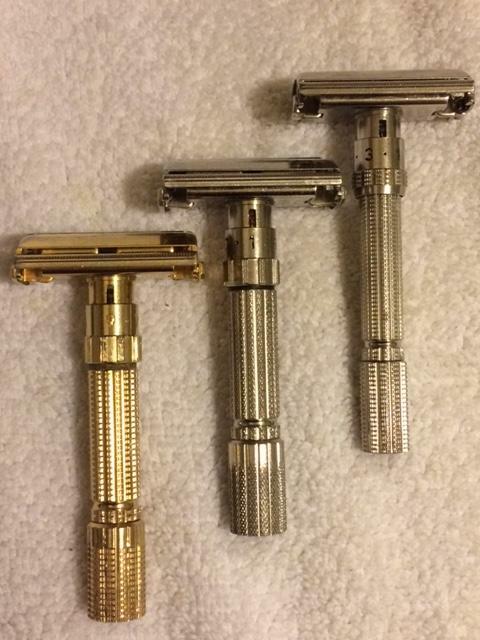 Junk shop score two days back: Gold Executive, F3, 1960; Fatboy F4, 1960; Slim, K1, 1965. The Exec. was sooo gunked up, at one point I despaired, but I persevered and apart from a cancer spot on the underside of the baseplate, it's now in perfect working order. Interestingly, it had red tarnish here and there, so I put some oxybleach in a cup and then the razor, then filled it to the brim with boiling water. Fifteen minutes later: shiny shiny shiny gold, evenly all over. Silo doors? Well, let's just say this razor had been used The Fatboy and Slim are in stunning original condition. What did I pay for the three? In US dollars: $38. Yep. Love happens. Congratulations on a great score. Wow nice and a great price! (02-28-2017, 03:10 AM)Mouser Wrote: Damn Shaun! Damn! Yes, wet shaving is still kinda in its infancy here in Australia. Products are pretty low key in general reach (pharmacists, supermarkets, etc) although there are a few more shaving outlets here and there now, but mostly importing goods. I hear Washpool soaps are pretty good tallow-based soaps though and they are Australian made, but I have yet to try them and review. In short, razors might be a little easier to come by than in the USA, Canada and the UK. But then again, I do hunt for them high and low, and know all the likely places. I sometimes get very lucky as you can see in some of my posts. I never buy from the USA because of the crazy postal costs which frequently run higher than the cost of the product being sold. Mad. It would be good some time to actually meet another Australian wet shaving enthusiast. I have been doing all this solo for years now, and so I am extremely grateful to The Shave Nook for enabling me to connect. Thank you, Shave Nook! . Very nice. On top of that, you find American and English razors ... Plus, I am guessing you get some influence/access to Japanese str8s (?) Nice place to be.